What is an Ultrasonic Flow Meter? For centuries scientists around the world observed various animals navigating the world around them without the apparent use of sight. As early as 1790, Italian scientists determined bats were using their sense of hearing to navigate through pitch black caves. While these scientists did not have the technology to further investigate this phenomenon, it was later discovered the bats were making ultrasonic clicking noises and using the echoes to determine the landscape around them. 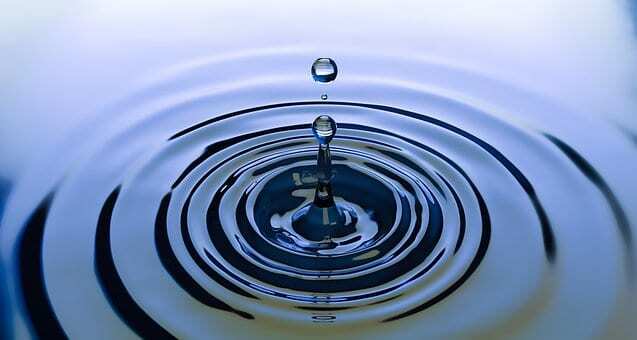 Ultrasonic sound waves are transmitted at a higher frequency than human hearing can detect, but modern technology has allowed us to harness them to measure many things - including the flow rate of air or liquids. The ultrasonic sound a bat emits bounces off the surrounding terrain and objects, and based on how fast the echo returns, the bat can determine how close an object is. How a bat developed ultrasonic ability is an interesting question, but we are going to focus on the science of ultrasonic sound waves and how we can use them to measure flow inside of pipes. An ultrasonic flow meter is used to gather information about a liquid or gas being transported in an enclosed industrial pipe or line. This is done by attaching ultrasonic transmitters and receivers to the outside of the pipe. Ultrasonic sound waves are emitted through the material inside the pipe and then received by the transmitter. Just as a bat can differentiate between the ultrasonic echoes in a dark cave to gauge the layout of the terrain ahead, the distortions in the ultrasonic sound wave can be automatically analyzed by special software to determine the flow, volume and other characteristics of the material inside the enclosed pipe or line. There are three main types of flow meters: Time Transit, Doppler shift, and Open Channel. The type of flow meter used is determined by the specifics of how the fluid or gas is being transmitted and exactly what type of fluid or gas is being transported. Imagine throwing a baseball 100 miles an hour. You would probably be playing baseball instead of reading this, right? Well, imagine you could for a day, and this newfound throwing ability could only be used to help explain how ultrasonic meters work. Now you are throwing the ball inside a closed room and it is registering 100 MPH on the radar gun. Now imagine the room is a wind tunnel, and with the wind against your back, your throw registers 110 MPH. With the wind at your face, your throw registers 90 MPH. In this hypothetical situation, with all hypothetical variables constant, we can determine the wind is traveling around 10 MPH. Think of the speed of the baseball as the speed of the ultrasonic wave being transmitted and the wind as the fluid it travels through. If the ultrasonic wave is sent from the transmitter at 100 MPH and is received at 90 MPH, it tells us the direction of the flow and the speed of the fluid. In this case, the flow would be the opposite direction of the transmitted signal because it slowed the total speed instead of accelerating it. By subtracting the ultrasonic sound waves end speed - 90 MPH - from the speed it was transmitted at - 100 MPH - we can determine the fluid it traveled through was moving against it at 10 MPH. The Doppler shift method resembles the bat’s ability to find its way in the dark mentioned above, or a dolphin’s use of SONAR to navigate underwater by bouncing ultrasonic sound waves off of the landscape around it. In order for the Doppler shift method to be utilized, the medium that is being measured must have particles, bubbles or some type of material suspended inside of it for the sound waves to bounce off of. The transmitter sends out the ultrasonic wave and it bounces off the suspended particles in the moving gas or fluid inside of the pipe or enclosed method of transfer. The varying frequencies of the return signal help determine flow velocity and other calculations regarding the flow of the medium. While the Doppler shift method is uncommon in HVAC applications because of the lack of suspended particles in HVAC systems, it is commonly used in the medical field to determine the flow of blood when diagnosing patients. The best method to measure flow is to take the measurement from a pipe that is completely filled with fluid, just like the water lines in your house. However, in gravity drain systems such as sewers, the method of determining flow is less straightforward. Open channel ultrasonic flow meters are designed to measure flow for these types of scenarios. They are usually installed by mounting a transmitter above an open channel of water, or other fluid, that bounces the ultrasonic sound waves off of the surface of the water to get a constant reading on the height of the water. Since temperature can affect the speed of sound, these meters are equipped with automatically-adjusting temperature sensors. The rising or falling height of the water in the channel can be used to make determinations and calculations regarding flow and volume when coupled with the geometric data of the channel itself. Chilled-water and cooling-tower units are often found in commercial buildings. These types of systems operate by using the flow of water to transfer heat out of or into a structure. An ultrasonic flow meter is useful during troubleshooting or performing routine maintenance on chilled-water and cooling-tower units. Common issues with these units can often be linked to a lack of flow. There are numerous flow switches in these systems that will hinder operation if the flow becomes too low. An ultrasonic flow meter can help determine if the flow is in the correct range for these switches to operate correctly. This allows the technician to quickly determine if it is a bad switch, an obstruction or a bad component somewhere else in the system. An ultrasonic flow meter can save a technician hours in troubleshooting time by allowing a definitive diagnosis to be made more quickly and without gaining access to enclosed piping and restrictive areas. Let’s take a look now at some of the options in ultrasonic flow meters available. 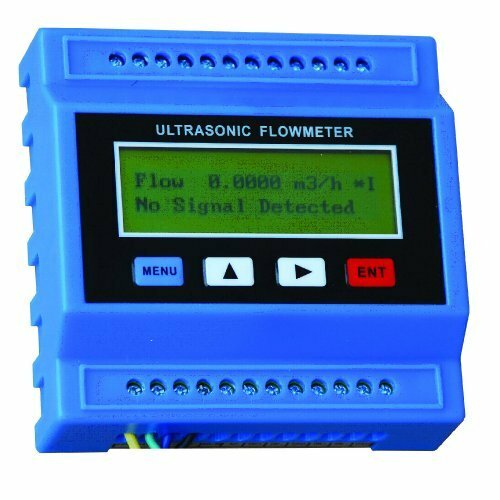 The Portable Digital Ultrasonic Flow Meter USF-100 measures the flow velocity of liquids in enclosed piping and tubing and is designed for quick and easy attachment and operation, making it ideal for industrial HVAC applications. This model is moderately priced compared to the other meters reviewed. It offers the same recharging option as the most expensive unit listed and a comparable package of accessories. Meter comes with a carrying case and kit. Designed for quick and easy installation and repositioning. No manufacturer warranty that we could find. 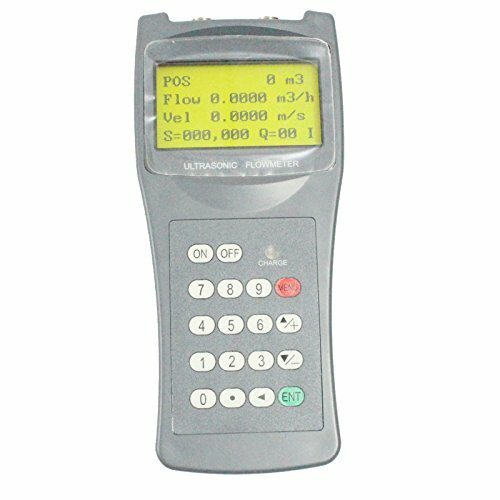 This meter is limited to transit-time method of ultrasonic flow metering. 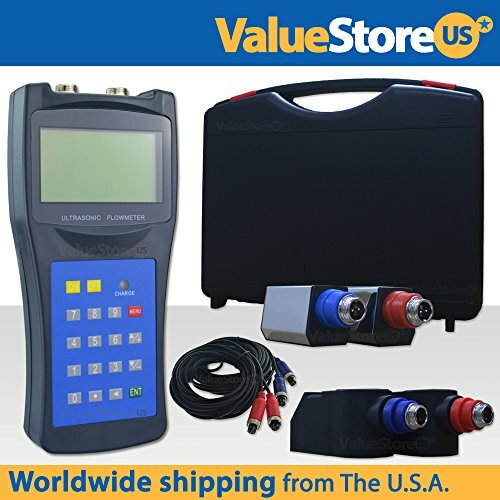 This meter measures flow velocity of liquids in enclosed piping and tubing and is designed for quick and easy attachment and operation, making it ideal for industrial HVAC applications. 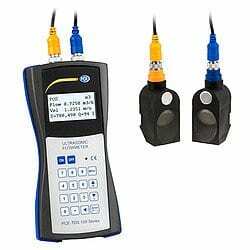 It is a clamp-on style meter allowing measurements to be taken without the enclosed system being compromised. No contact with the liquid being measured is necessary. Company website and contact information. Includes 2-year warranty against manufacturer defects. 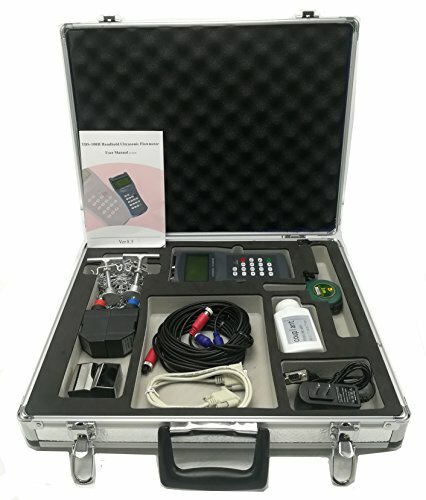 Meter comes with carrying case and kit containing everything needed for use. User-friendly Velcro-strap clamps that allow for quick and easy installation and repositioning. This meter measures flow velocity of liquids in enclosed piping and tubing and is designed for quick and easy attachment and operation, making it ideal for industrial HVAC applications. This meter has a lockout feature if the meter is used as a static monitor. 2nd most expensive of the five meters being reviewed. This meter from Holdwell measures flow velocity of liquids in enclosed piping and tubing and is designed for quick and easy attachment and operation, making it ideal for industrial HVAC applications. This model offers a great deal of functionality and accessories for a very low price. 2nd cheapest of the five meters being reviewed. Meter comes with a carrying case, user guide, and kit. M&A Instruments offers this meeting that measures flow velocity of liquids in enclosed piping and tubing, making it ideal for industrial HVAC applications. This product comes with the meter only. Its cheap price and lack of accessories make it an ideal backup meter or an economical choice if you already have transducers and other accessories. Cheapest of the five meters being reviewed. Transducers and accessories not included. Ultrasonic technology is an amazing and useful tool for top HVAC technicians who work on industrial systems. Before ultrasonic flow meters, there was no reliable way to measure flow without gaining access to closed systems. Even then, the measurements were not taken during “true operation”. We hope you enjoyed exploring the innovative side of the HVAC industry in this article and gained some insight on ultrasonic flow meters available for HVAC applications.